Park visitors sprayed graffiti on rocks, damaged the soil with offroading and cut down the park's iconic 300-year-old trees. The U.S. government shutdown may be over — for now. 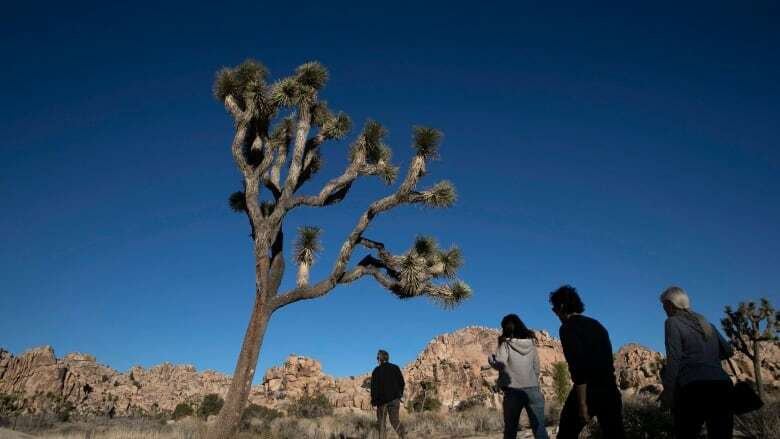 But in Joshua Tree National Park, those 35 days did damage it will take centuries to fix. Park visitors sprayed graffiti on rocks, knocked over some of the nature preserve's iconic trees and left tire marks all over the desert. One retired park superintendent estimated the park could take up to 300 years to fully recover, the Palm Springs Desert Sun reports. Rand Abbot, a local climber who was part of a volunteer brigade that helped maintain the park during the shutdown, spoke with As it Happens host Carol Off about the shutdown's impact. How long do you think it's going to be until Joshua Tree National Park recovers from the damage that was done during this government shutdown? Some of the damage is going to take a couple of hundred years to come back — because it needs to be repaired by Mother Nature, not by us. Some of the microbiotic crust — we call it desert glue — there's soil in the desert, it's not all sand. It takes hundreds of years for that to form, and when it gets damaged, it's going to take three to 500 years for that to come back. Can you explain how it got so damaged? The areas of the park that are considered wilderness area, where you're only supposed to be hiking on desert trails and no vehicles — those areas had quite a bit of off-roading, people taking their vehicles and driving through those areas. They actually made new roads to get to certain areas. And what got damaged in the process is the desert glue, the macrobiotic crust. It's ignorance that causes it. Probably 80 per cent of the damage was done out of ignorance, not out of malice. But they took advantage of the fact that there was very little supervision during the government shutdown? Yeah. The stuff that happens happens all the time, but because of there not being anybody there that was in a national park uniform, people basically just did whatever they wanted to do. What happened to some of the Joshua trees? There was a bigger one that somebody climbed up on. And because of the weight of people being on it, the limbs broke. There was one that park rangers reported was cut down so that people could drive past a gate. And a lot of juniper trees were damaged. It's a beautiful tree, and it burns — so people were cutting it down and using it for firewood. I saw on four or five occasions where they had taken an axe to it and chopped the tree down. This happened in campground sites. But wouldn't you make some assumptions that people who had gone through the trouble of camping in your park would respect those trees? I would like to assume that. But like I said earlier, a lot of this damage is stuff that happens on a regular basis out here. I'm a climber. Even though I'm paralyzed, I rock climb. And there are numerous time where I go in to the park to climb and I see so much trash laying around that I go back to my van and get a trash bag and I spend two or three hours picking it up. And then I don't climb. People will plan their trip, they'll buy their sleeping bag, they'll buy a tent. They'll go online to Google Maps to figure out how long it's going to take. They'll go grocery shopping. But they don't spend five minutes on the national park webpage to learn the rules and regulations and find out why it's important not to do this. This mentality of "Somebody else will clean up after me" or "it can be fixed" — no, it can't be fixed. That tree is probably 300 years old and we can't just plant another one. You're part of the volunteer brigade. Why does the park matter so much to you? Two reasons. One, I believe that we're the guests in the park. The animals that live in the park are the true residents, not me. The second reason is when I got paralyzed, when I got back to rock climbing, the first time I climbed and I got 50 feet up on the side of a rock, and I looked down and my wheelchair was empty, I was free. The rock doesn't care that I'm paralyzed. So it helped me to reassure the mindset that my disability does not have to define me. It's not who I am. That's what Joshua Tree did.